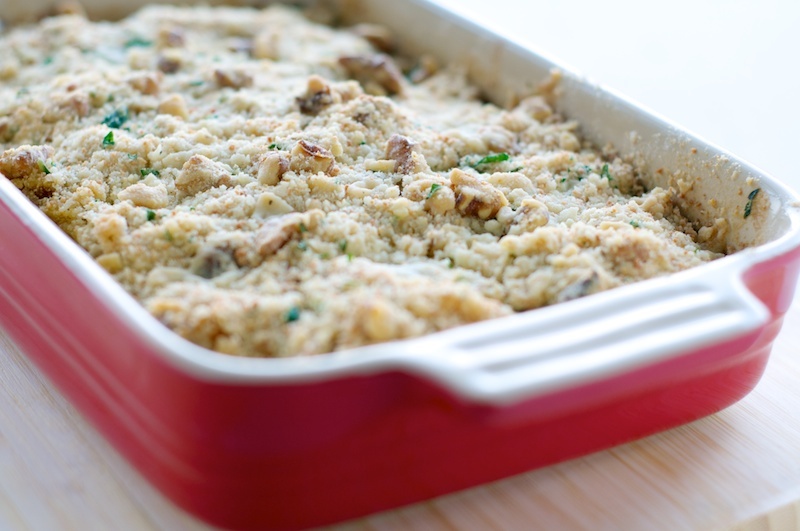 This is my first savory crumble and will no doubt go down as a favorite side dish. I haven’t explored much in this territory outside of the sweet berry crumbles but I’m thinking to try more of these. It’s absolutely delicious, I made it yesterday as a side with roast chicken and Apple + Kale Salad, it all worked so well together, Jeff said I’m getting good at this, ha ha. Me? 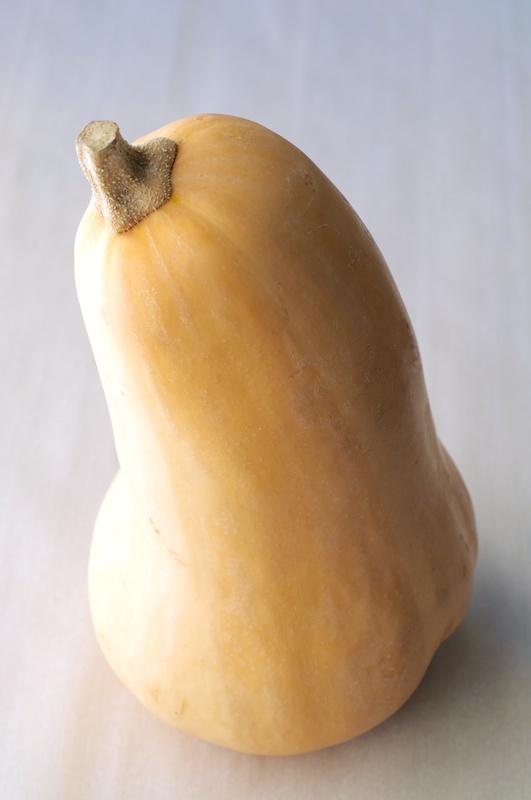 The biggest challenge of this recipe was cutting up a butternut squash, the whole time I was hacking away at this thing I kept envisioning that pre-cut squash at Trader Joe’s, that would have been a whole lot easier. But I appreciate eating fresh produce from the market so a little sweat is required sometimes (um, and tears, that onion was insanely strong! I kid you not) But I survived. 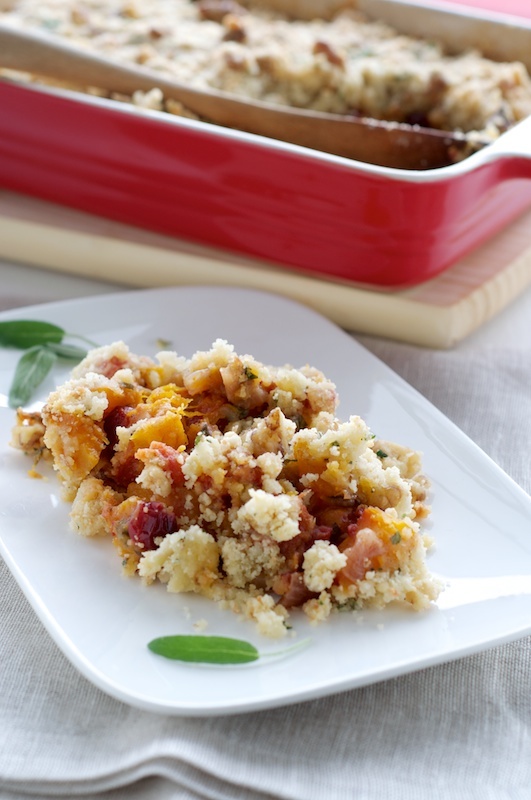 The Butternut Squash Crumble recipe is from Beatrice Peltre in the Boston Globe, the only change I made was to add cranberries, and I highly recommend it, they work nicely with the herb flavors and add some nice color as well. Oh, and I would suggest taking it easy on the salt, the parmesan gives enough saltiness to the dish so that you really don’t need too much. And I probably don’t need to mention that this would be great for the upcoming holidays, but it really would and I just did. In a bowl combine the flour, walnuts, parsley, Parmesan, and a generous sprinkle of pepper. Add the butter and work with your fingertips (or fork if butter is chilled) until the mixture forms coarse crumbs. Cover and refrigerate. In a large skillet over medium heat, heat the olive oil. Add the butter until melted, cook the onion, coriander, and bay leaf, stirring occasionally, for 3 minutes or until onions are softened. Add the tomatoes and cook for 3 more minutes. Add the butternut squash, cranberries, sage, salt, and pepper. Turn down the heat. Cover and cook for 25-30 minutes or until the vegetables soften. Preheat oven to 350° and butter a 10-inch baking dish.